Last Saturday I had my first workshop to showcase the brand new Stampin' Up! Fall/Winter Catalog. I gotta tell you I love so many of the new sets and the new Designer Series Paper, oh and the accessories! My wish list is so long I've had to make more than one! Well, we made two cards and a cute box at the workshop. I was a little nervous because it had been a long time since I had a workshop but everyone had fun and I got 2 bookings as a result! Yay me! The first card we made uses the set Inspired By Nature, which was one of the free sets from convention! To be honest, at first I wasn't too keen on this set but it has definitely grown on me and I am starting to love it! 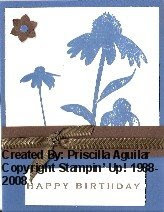 This particular card was actually a case from September's Stampin' Success. I didn't have the Pacific Point Blue designer paper that is used in the sample so I had to improvise. Hope you like it. This next card is actually a case from Patty Bennett's site and can be found here. 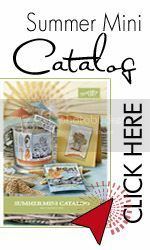 If you've never been to Patty's site you have to check it out, she has so many amazing projects and ideas, I love going to her site and I guarantee that you will too! I had to change my card a bit because I didn't have all the supplies that Patty used on hers but I think it came out nice, and the girls at my workshop loved it! So thanks Patty for the inspiration! Well, that's it for now. I still need to upload a picture of the box we made so hopefully I'll get that done and posted for you tomorrow. 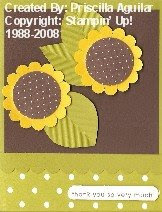 Until then, Happy Stampin'! Hi everyone! This is my very first post and I'm excited yet nervous. 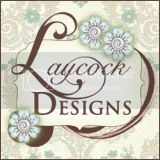 I will be using this blog to share any new projects that I make either for my own personal use as well as those projects that I make for my Stampin' Up! workshops and classes. 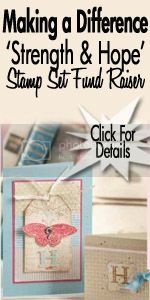 I will also be posting any Stampin' Up! news for all my customers! Thanks for joining me and I hope you enjoy your visit!